The boys are out! They’re ringing in the New Year with their vacation photos, some with their boy friends. We’re actually loving them, aren’t we? Prince and Paolo are in Bangkok for the White Party. Janjep Carlos headlined the Bangkok White Party. Ahron Villena is somewhere in the Swiss Alps with beau. 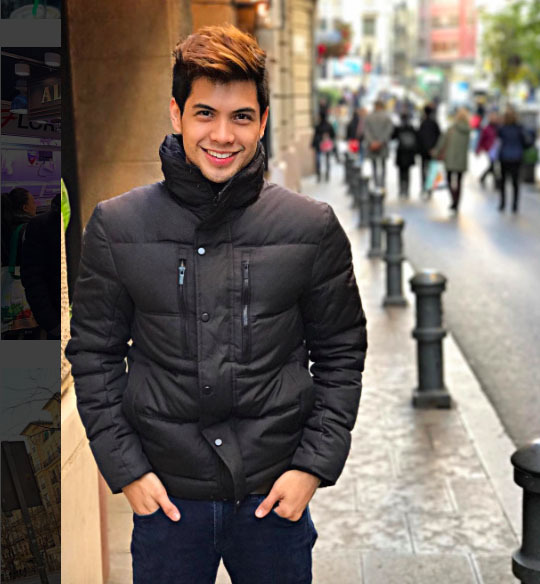 Kennedy Alfonso is also in Europe with bf. Sshh. Alex Diaz spends time with Sam Concepcion in La Union. Welcome back from the USA, Prince Stefan! We sincerely hope you get back into showbiz. At once! This may be a tad late, but recently Prince Stefan finally addressed head on the issue persistently hounding him. No, he says, there is no truth to rumors that he’s gay. Although he does not have anything against gay people, as he admits he’s often in the company of his gay cousins and gay relatives, he says he’s just not into,uh, stemming the rose. So there. Let the issue die. Ok now. Is Stephan Andrei Anlocotan a.k.a. Prince Stefan joining Mossimo Bikini Summit this year? Is he pulling a bikini stunt in the annual contest? This is not the first time that a Starstruck alum went on board the competition: batch mate Dex Quindoza was in the 2009 edition. Photo above came from the GMA Artist Center Black Book Catalog 2011, which will be launched end of May. They failed to include him in the GMA Artist Center TV plug for 2011 leading men, and I’m left wondering why Prince Stefan was left out – outran and outstripped by wannabes lacking in the good looks department. Let us support our handsome boy Prince Stefan so that he will get good projects this year. He has mended his ways, and has put his mind back to work in show business!